Product prices and availability are accurate as of 2019-01-13 07:46:37 EST and are subject to change. Any price and availability information displayed on http://www.amazon.com/ at the time of purchase will apply to the purchase of this product. Built to deliver just the torque you need where you need it, the Craftsman 10-piece ratcheting combination wrench set features a rugged build, fast turning ratcheting box end and easy to clean smooth polished finish. A shop essential, this set delivers that quick grabbing action of an open ended wrench combined with the continuous contact of a ratchet for just the right grip on the box end. 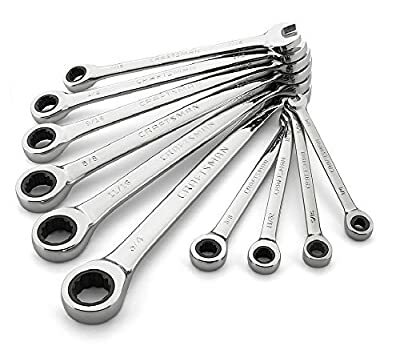 Whether you're reaching deep into the guts of an engine, crammed into the space below a sink or working fasteners on a sun deck this wrench set is ideal. Clearly marked, this 10-piece inch flat wrench set gives you the right size when you need it, while the tough alloyed steel construction and lifetime warranty ensures that this set will work hard and as long as you do. A solid addition to garage, shop and job site tool kit, grab this 10 piece and get turning for life.